For 20 years, physicists in Japan have monitored a 13-story-tall tank of pure water cloistered deep inside an abandoned zinc mine, hoping to see protons in the water spontaneously fall apart. In the meantime, a Nobel Prize has been won for a different discovery in the cathedral-esque water tank pertaining to particles called neutrinos. But the team looking for proton decays—events that would confirm that three of the four forces of nature split off from a single, fundamental force at the beginning of time—is still waiting. “So far, we never see this proton decay evidence,” said Makoto Miura of the University of Tokyo, who leads the Super-Kamiokande experiment’s proton decay search team. 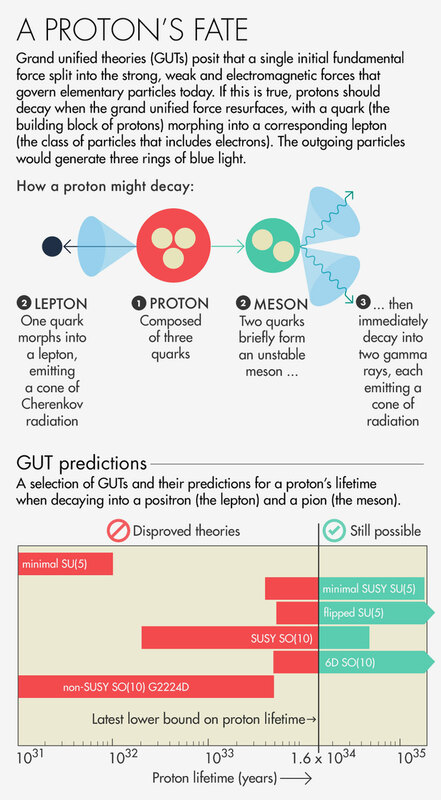 Different “grand unified theories” or “GUTs” tying together the strong, weak and electromagnetic forces make a range of predictions about how long protons take to decay. Super-K’s latest analysis finds that the subatomic particles must live, on average, at least 16 billion trillion trillion years, an increase from the minimum proton lifetime of 13 billion trillion trillion years that the team calculated in 2012.The findings, released in October and under review for publication in Physical Review D, rule out a greater range of the predicted proton lifetimes and leave the beloved, 1970s-era grand unification hypothesis as an unproven dream. “By far the most likely way we would ever verify this idea is proton decay,” said Stephen Barr, a physicist at the University of Delaware. Without proton decay, the evidence that the forces that govern elementary particles today are actually splinters of a single “grand unified” force is purely circumstantial: The three forces seem to converge to the same strengths when extrapolated to high energies, and their mathematical structures suggest inclusion in a larger whole, much as the shape of Earth’s continents hint at the ancient supercontinent Pangea. If the forces were indeed one during the “grand unification epoch” of the universe’s first trillionth of a trillionth of a trillionth of a second, then particles that now have distinct responses to the three forces would then have been symmetric and interchangeable, like facets of a crystal. As the universe cooled, these symmetries would have broken, like a crystal shattering, introducing distinct particles and the complexity seen in the universe today. Over the past four decades, physicists have proposed a variety of GUT models that describe possible initial symmetric arrangements of the particles. Finding out which model is correct would reveal not only the underlying mathematical structure of nature’s laws (and how they might square with the fourth force, gravity), but also what other particles might exist besides the known ones. This in turn could potentially solve other deep mysteries of physics, such as the universe’s matter-antimatter imbalance and the unexplained masses of neutrinos. “Our dream, of course, is to have a unified theory of everything,” said Dimitri Nanopoulos, a physicist at Texas A&M University who coined the term GUT. The dream of grand unification began in 1974, when the future Nobel laureate Sheldon Glashow, now at Boston University, and Howard Georgi, now at Harvard, discovered that the mathematical symmetry groups known as SU(3), SU(2) and U(1), which correspond, respectively, to the strong, weak and electromagnetic forces and together form the “Standard Model” of particle physics, can be incorporated into a single, larger group of symmetries that relate all the known particles at once: SU(5). “We thought it was absolutely beautiful,” Glashow recalled. But the proton lifetime predicted by that first, and simplest, GUT model, along with the first thousandth of the range of proton lifetimes predicted by other models, has already been ruled out. Super-Kamiokande is now probing the range of predictions of several popular proposals, but with two decades under its belt, it won’t be able to push much further. “It’s harder to do much better now because it’s accumulated so much data,” said Ed Kearns, a physicist at Boston University who has worked for Super-K since the experiment started. If grand unification is indeed correct, this means that fundamental symmetries existed at the beginning of the universe and then broke as the temperature dropped, just as water, which looks the same in every direction, freezes into ice, which has distinct directions. Symmetries are transformations that leave something unchanged. Rotate a square 90 degrees, for instance, and it looks the same as before. For a rectangular object to exhibit this rotational symmetry, it must have four identical sides. Likewise, if a certain symmetry exists in the laws of nature, then a set of symmetric particles must exist to realize it. 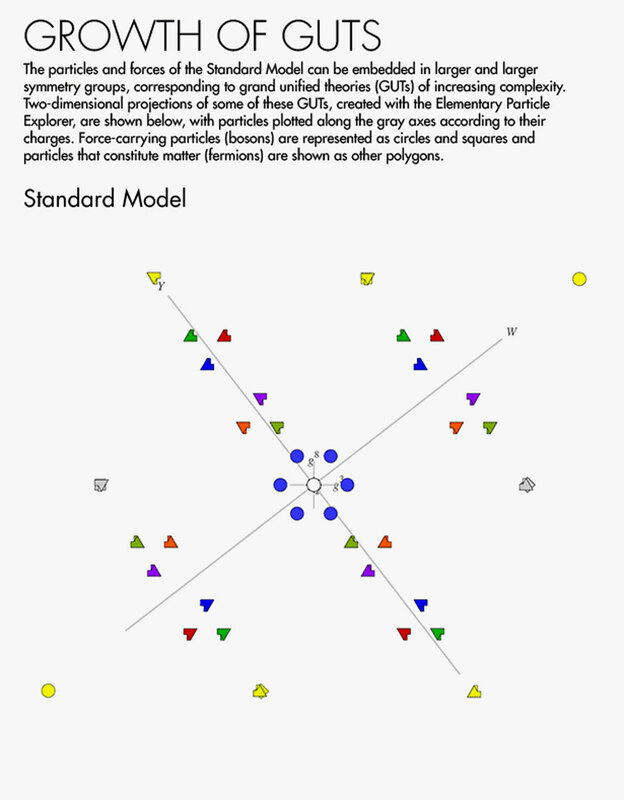 Elementary Particle Explorer, designed and written by Garrett Lisi, Troy Gardner, and Greg Little. Take SU(3), the collection of symmetries corresponding to the strong force (which glues quarks together into protons and other composite particles). 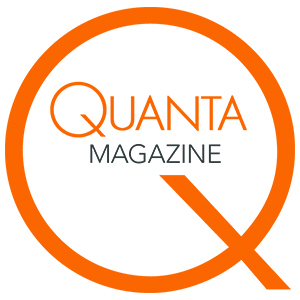 This symmetry group includes the rule that “up quarks” (one of the six types of quarks) come in three different charges—often labeled red, blue and green—that are interchangeable. That is, if you switched all the red up quarks in the universe for the blues, all the blues for the greens, and all the greens for the reds, no one would be able to tell. “Down” quarks and all other quarks also come in these symmetric triplets, which are like sides of an equilateral triangle. Gluons, the eight particles that convey the strong force, can be thought of as the rotators of the triangles. Meanwhile, the SU(2) symmetries associated with the weak force (which is responsible for many kinds of radioactive decay) include a symmetry between, for example, up quarks and down quarks. Switch all the u’s and d’s in the equations describing the weak force, “and you’re never going to understand that I have done this,” Nanopoulos said. GUTs such as SU(5) include all the symmetries of SU(3), SU(2) and U(1) and add new ones to the mix. For instance, SU(5) groups quarks and antiquarks together with leptons and antileptons into “fiveplets,” which are like the indistinguishable sides of a regular pentagon. The particles that normally convey the strong, weak and electromagnetic forces are identical in this larger mathematical structure; all 12 of them, and an extra dozen that arise naturally, convey a single “grand unified” force. When they discovered the SU(5) model, Glashow and Georgi immediately realized that the 12 extra force carriers present in the structure of SU(5) would trigger proton decay. When SU(5) broke into the three pieces seen today, 12 of the original force carriers would have taken their present forms, but the other dozen, rather than disappearing, would merely have become extremely heavy and weak. These ghostly force carriers would occasionally materialize and swap a quark for a lepton. Georgi and others calculated that if the SU(5) model is right, then the average proton (which is made of three quarks) will decay within 1029 years. This prediction was falsified in the 1980s by both the Irvine-Michigan-Brookhaven experiment in Ohio and the Kamiokande experiment, Super-K’s predecessor. Some wiggle room was found, leading to a new, roughly 100-times-longer proton lifetime prediction, but this wasn’t enough. A few years after going online in 1996, the Super-K experiment definitively ruled out SU(5). “Everybody was crestfallen,” Barr recalled. The situation has only gotten more ambiguous since then. Whereas SU(5) was as simple as possible, researchers have found a variety of other symmetry groups that the existing particles might fit into, with extra features and variables that can make protons decay much more slowly. Some of these models add an extra symmetry, called “supersymmetry,” that doubles the number of particles. Others, like flipped SU(5), rearrange which quarks and antiquarks go with which leptons and antileptons inside SU(5)’s fiveplets, tacking on an extra symmetry in the process. Super-K’s latest result, which sets the lower limit on the proton’s lifetime just above 1034 years, moves into the region of interest of many models—including that of flipped SU(5), which predicts that protons will take between 1034 and 1036 years to decay. “I’m very excited about this,” said Nanopoulos, one of the researchers who developed flipped SU(5) in the early 1980s. But while Super-K could suddenly strike gold in the next few years and confirm one of these models, it could also run for another 20 years, nudging up the lower limit on the proton’s lifetime, without definitively ruling out any of the models. Grand unification hasn’t died, exactly. The circumstantial evidence is as compelling as ever. But the idea could remain in perpetual limbo, rather like the proton.